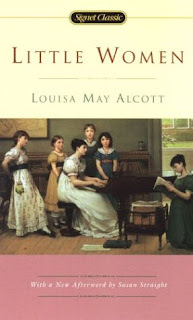 I recently revisited one of my favorite books - Little Women. Not surprising, it was still relevant. It's a bear of a book in length, but the full and detailed tales of these 4 characters helps the pages turn a scant more quickly. I find a bit of each March daughter in myself. Unfortunately, more bratty Amy than tenderhearted Beth. More more. My friend Joseph posted this gem and I now need to help increase its virality. Is that a word? Firefox says no. This video features Fredrick and his take on some of my favorite TV show themes. Joining him is himself. The two of them are delightful. Little Women. Never read it. Never will. But I did have to watch the most recent movie (the one with Susan Sarandon's big dumb face in it) on a cross Atlantic flight. That movie will play on the slow boat to hell and everyone will have to watch it. J: It's too bad they removed your ability to feel when they gave you all those growth hormones.